The president commented on the so-called "Medvedchuk plan". 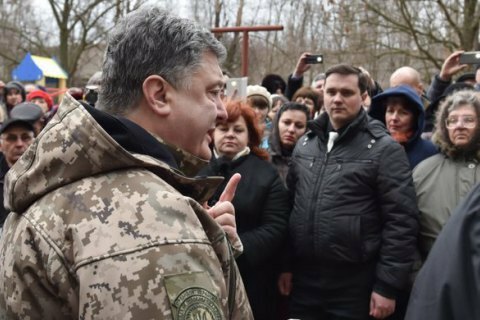 President Petro Poroshenko has said he will cooperate with Rinat Akhmetov and Yuriy Boyko if they win a fair election in the areas of Donbas outside Ukraine's control. "The Minsk agreements say it absolutely clearly that Ukraine's sovereignty in the occupied part of Donbas should be restored through an election. If someone who has not had their hands marred in blood, who has Ukraine in their heart, decides to run in these elections and gets elected by the people of Donbas, I as the president of Ukraine will work with them," he said at a briefing in Kramatorsk, when asked to comment on Rinat Akhmetov's possible appointment as head of the Donetsk regional state administration. "IF Mr Akhmetov or Mr [Yuriy] Boyko decide to run and win the election, and they are supported by Donbas, this will be a choice of the people of Donbas," the president said. "I would like to stress that reconstruction must proceed not by means of appointing military-civil administrations but through the mechanism of elections. This is how it is going to happen," Poroshenko said. Ukrainian President Petro Poroshenko has taken an interest in a so-called "Viktor Medvedchuk's plan", according to which separatist-held areas of Donetsk and Luhansk regions will be brought under the administration of people suiting both Kiev and Moscow, the Dzerkalo Tyzhnya weekly has quoted its sources as saying. Medvedchuk is the leader of the pro-Russian movement Ukrainian Choice and Ukraine's representative for humanitarian issues at the trilateral contact group on a Donbas settlement. He is also believed to be a close associate of Russian President Vladimir Putin. The weekly named Rinat Akhmetov and Yuriy Boyko, both businessmen from former President Viktor Yanukovych's entourage, as potential heads of new administrations.